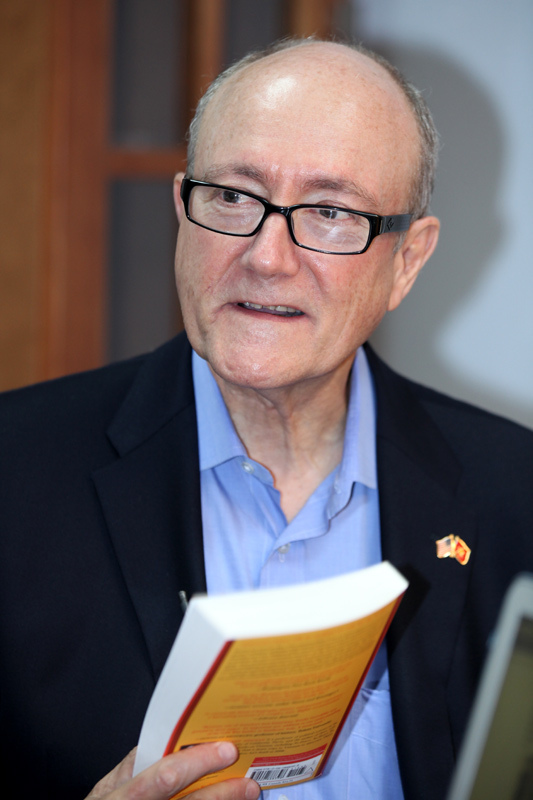 VietNamNet would like to introduce the second part of columnist Viet Lam’s talk with American writer Larry Berman about his book entitled “Perfect Spy”. Larry Berman: Do Hung is a good reporter. He never stops asking questions and this is a good question. There is only one or two things that An told me that I will never tell anybody. They are not earth-shattering. They are more personal about people. And as long as those people are alive, I cannot tell those stories. But he told me nothing about the secret of his spying that I have not written about or shared or anything like that. There are two things that personally I just cannot disclose. But there is no smoking gun. So, everything that I know about Pham Xuan An is in this new edition. With one edition, which is in the TV series (we talked about the TV series), I think we are trying to add something that will be new. Viet Lam: A reader asked: “Do you have any intention to release another updated edition of the book with new details in the future? Larry Berman: I think that there would not be enough to compose a new update of the book. There are a lot of new materials in the new translation. There are new perspectives. I have been asked and I think I will write a book about the H.63 network, Tu Cang… That would be an interesting feature, right? He was interested in doing this, which would be good. There is a problem for me, which is that, An spoke English and he spoke English very well, so I was able to interview him and and speak very easily. But most of the H.63 do not speak English like An did. It would be more difficult for me because I do not speak Vietnamese. So I am still thinking about what to do. I want the readers to know that I do not have any big secrets that are hidden and that I cannot talk about. I have tried everything I can in this book, except personal things that An told me that are not about things people would necessarily think worth sharing. Viet Lam: The first impression when I read the book is that you made very clear that the special factor from An is that he lived a very truthful life under his cover. That is what you call “incredible double life”. Many readers might think that it is unbelievable for a spy to live truthfully among lies. So, after your meetings with An, could you explain it to me and our readers? Larry Berman: This question has come to the key of Pham Xuan An because he was hiding a play inside; that is what he was doing: hiding a play inside. How could he do it? In the book, I talked about this and An and I talked about it. In order to survive, he became his mask. In order to succeed as a spy, he had to become the very best journalist that he could. And he totally became that person because he did not make any slip. So, by becoming that person and living that mask for so long, he became a very successful spy. But the consequence, the result for Pham Xuan An, was that when the war was over, and they said OK, you do not have to be a spy anymore. Who was An? He did not know in many ways because he had lived that mask and had been someone else for so long. Who was he going back to being? The person he was going back to being had been a 25 year-old kid. And now he was 50. How long it would be for him to cover up what had been gone? So I think he did it by becoming his cover, or becoming his mask. But then he had to live the rest of his life with the consequences of that. Larry Berman: It is in my book that I discussed the two questions. The first question is “Did An discuss with me how he thought about Vietnam after the war?” Yes, he did. At least, and I think it do not think it is any secret, An was disappointed after the war. He thought that the reconciliation would happen very quickly. He was naïve about that. He thought that there would be reconciliation between North and South, and also between Vietnam and the U.S. But that would not happen. And you know, An was sent to political education for one year to learn about Marxism and all the theories that were guiding Vietnam. Then when he went back to Ho Chi Minh City, he felt out of place. I talked about that in the book. The consequence was that he paid a great price for that. He did not have a visitor for a long time and he never was able to go to America as he wanted. But instead, his son was able to do it, which is OK for An. That is what he thought. Once I asked him that question I thought maybe he regretted going from the U.S. back to Vietnam. And he said he never regretted that. That was his duty and obligation. Also I asked if he regretted not leaving Vietnam with his wife and family in 1975 and going to the United States. He said that he regretted that but he would not leave his mother. His mother was ill and could not go, so he would never abandon his mother. But that is why he allowed his wife and children to go. He, of course, recalled them. But if his mother was healthy, I believe that he would have gone with his family to the United States. Then he would not have waited for the instruction from Hanoi as to whether he would like to continue his mission, perhaps reporting on what was going on in the United States. An did not regret joining the revolution or what he had done. His one regret for Vietnam that, we were just talking about, was right after the war, he felt that there was an over-reliance on the Soviet Union other than other models that could have been used. He and I talked about that in the book as well. And he was very sad that he never got to go back to California to Orange Coast College and where he wanted to go. When I first met An, he took a box shell. And in that box, he would save everything from when he was a student in California. It has the most important personal position in his life, not his medals, but his things from California. You could see what it meant to him. I think it is his major regret. Viet Lam: You described An as a lonely spy, lonely hero. I think this is common for many spies. Another thing I felt from what you said is that he was a man many internal conflicts. What do you think about it? Larry Berman: An had worked his cover as a journalist so he experienced the American way of journalism, free press, the ability to think and write in a totally different way. An wanted that for Vietnam. That was his dream. When the war was over (since he was an expert of America, he had spent 20 years studying in America), he thought that the new Vietnamese leadership would turn to him and say “OK, what you learnt is helpful, so what do you think about journalism, about the media, press and new ways of thinking that have made you such an interesting and engaging personality?” Then he felt that no one was interested in that. He could not practice his trade, he could not be a journalist. And he was very conflicted, so he had to shut up. I mean that is what happened because he made a trade. I talk about that in the book. Under certain terms, he agreed to stop talking like he was talking. In return, the government allowed his first-born son to go to the United States, major in journalism, get a Fulbright scholarship, become a lawyer and come back to Vietnam. So An’s son will get all the ability to live the life that An could not. Today, his son is living that dream. He is one of the most important people in the new Vietnam, a great spokesman for Vietnam and America. He has everything that An wanted. So he was conflicted. But he had a way out. So, I think that is a beautiful Vietnamese story and many people do not have the chance to live the dream that way he did. Viet Lam: I think that we are so lucky now that everyone, even the leaders, can look back at the past and laugh at those naïve things in the past, right? That is why you can write about Pham Xuan An and publish in Vietnam today. I think that is a big change? Larry Berman: Yes, it is a big change, a new Vietnam. This book would not have been able to publish 10 years ago. I am very hopeful that one day, we will be able to see all the reports of Pham Xuan An. Some young historian will be able to write their book and people will say that I remember Larry Berman many years ago…but if he had been able to see all the report, he would have been able to write a better book, which is true …and I am also excited. I just want to tell the listeners that I am very excited. Yesterday I met with the screenwriter of the 30-episode television show based upon this book. I think it would be a great interest in Vietnam because it would be a very accurate account of An’s life at the personal level, so I am very excited. Viet Lam: This is another question from our readers: “Is there anything that you regretted that you had not been able to ask An? Larry Berman: We would need another two hours to answer that. There are many things that I regret not asking An. I am smaller today than when I was interviewing him. I know somewhat more things I would have pressed him on more about: some of the medals that he won and I did not even know about until after my book was published. I would also love to know about his role in Lam Son 719, which is a really important military excursion that An was involved in what we now know. But I would love to ask him more about his report. And I would like to ask him about some of the issues with the CIA as well. So there are many things I would like to ask him if I could. I once asked An if he had any regrets and I have been asked this question a hundred times. And he said “no, because I had to do what I did. There is no sense crying over spilled milk. I had to do my mission. We had to get rid of the Americans. So I do not regret what I did. I just regret how it all turned out.” That is a very interesting answer. That is another book right there. Viet Lam: Audiences are now expecting the film about Pham Xuan An, which is expected to be released next year and we are sure that it could be a very interesting film. That is quite related to the context in Vietnam now. The State funds historical film projects, but they draw little attention from the audience. What makes a historical film or a historical book appealing to the readers and audience, in your opinion, as a historical biography? Larry Berman: I am glad that you asked that question. This is the film that would be 30 episodes, dramatic television recreation based upon my book. It is not a documentary, not a historical documentary at all. This is made for television, a drama series. The screenwriter is Phan Thuy Nhan and I met him yesterday and we were talking about that. His writing is a different mode than history documentary, which no one will watch. I agree with that. 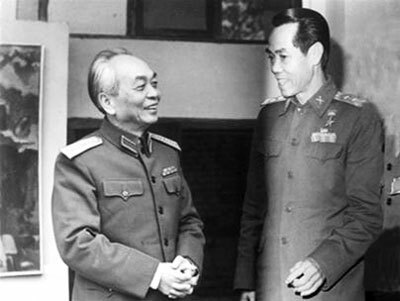 General Vo Nguyen Giap (left) and Major-general Pham Xuan An. The director Bui Tien Dong is thinking about it as a dramatic episode TV series based upon the book. So it is not going in chronological order. It is going to have a love component, drama, a friendship, spy, and deception. And we are told that story. Then they hope people will want to watch and they will know that is based upon Larry Berman’s Perfect Spy X6. But they will take license as well, creator’s license and make it appealing to the public. I am very happy about that and I will be a consultant on it so we spent a lot of time talking about the character development. Hopefully people will watch because it will be a different kind of document. It is not a documentary, it is a TV series, a TV drama show. Viet Lam: You answered my question about what makes a historical book or film appealing to the audience. That is, you told a story through personal destiny and a personality, which makes it more appealing? Larry Berman: It is a dramatic recreation based upon the book. So, it is not going to be a series from page one to page 40. It is not straight history. Human interest, personality, love, An, An’s love, his love of his country, love of his girlfriend in California, of his wife and family, and also love of his dream. Really this series is about his dream that An had, the dream that we have been discussing for the last hour. So hopefully it will be effective. And also the producer Cat Tien Sa wants to make it a dramatic show, not a boring history show. That is not their business. Their business is entertainment. I want to entertain, too. This TV series will be in English and Vietnamese because there are so many Americans in An’s life. So there will be both Vietnamese and English subtitles. So I think drama will help, it is not just a docudrama. Viet Lam: Is there any chance for the audience to hear An’s voice? It means that you recorded a lot of meetings with him. Is there any chance in the future you will release those tapes? Larry Berman: Yes, it is my intention to release all the tapes. I am going to make them all available to any researcher in the world. I am going to do this in a very short time so that people can listen to these tapes anytime. I am very happy, too. Viet Lam: And the last question: You said the book is not about spying. You want to tell a story of a personal life of a spy. So what you want to tell Vietnamese readers? Larry Berman: The book is about spying and a spy, but the big story is about a man’s life and the way he negotiated, the conflicts and challenges of that life and how it became an extraordinary life. So it is a story about patriotism, about services, spying and reconciliation. One picture in the book, the most important one is on the USS vessel, and there is An and his son on the very first ship that ever came to Sai Gon Harbor after the war, the first American vessel. An is the VIP guest. In the book An said he could die happy on that day because the war is over and Vietnam and America were on their road to friendship and reconciliation and everything he had done had reached its peak on that day. That is, the story of Pham Xuan An is about the perfect spy on the top, but also the incredible life of this man who went from being a top spy in the world, a general, a hero in the revolution, to become one of the most important people of the reconciliation between the two countries. That is an amazing story, very unusual. Pham Xuan An was born in 1927 in Bien Hoa in the southern province of Dong Nai and died in 2006. During his life as a secret agent, major-general An, whose alias was X6, worked for the intelligence group H63 in Sai Gon, which was then called Ho Chi Minh City. He was a strategic spy and played an important role in the resistance war against the American invaders. He was a reporter for Reuters, Time magazine, and the New York Herald Tribune and received several honors from US politicians and the media. He befriended everyone who was anyone in Sai Gon, including American journalists such as David Halberstam and Neil Sheehan, the CIA’s William Colby and the legendary Colonel Edward Lansdale, not to mention the most influential members of the South Vietnamese government and army. In “Perfect Spy,” Larry Berman, who An considered his official American biographer, chronicles the extraordinary life of one of the twentieth century’s most fascinating spies. The first edition of “Perfect Spy” was launched in 2007 and the second edition “Perfect Spy X6” was published last year. A 32-episode television film on An will be shot soon in both the US and Vietnam. Each episode will be of 45 minutes and the budget will be around US$ 1 million. Larry Berman also intends to make another 120-minute movie on the spy.